For many, tabs are, at best, a nuisance or a mere afterthought. For us, tabs are a specialty. Welcome to the web's only site devoted to Tabs. We designed our system from the ground-up, with the goal of making it easy, fast and affordable to order custom and blank tabs. Our online system is totally digital and this avoids the extra costs and the hassle of typesetting mistakes. Our range of products is the broadest in the industry. 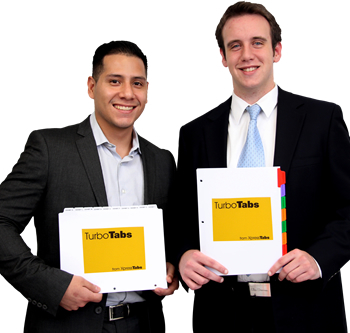 From custom binder tabs printed overnight to bulk packs of tabs for your high speed Docutech printers, we offer an huge array of different types of tabs. Virtually any color, collating, size, hole and print option is available. We can even print the entire tab sheet - in full color. If you have any questions about your job, please call your TurboTabTeam. We will help your project turn out beautifully and make sure that it all comes together on time. You handle the document printing. Let us handle the tabs!